It does this because the line of force the ball is producing on the clubhead doesn’t run through the clubhead’s centre of mass. This causes a torque (twist) around the COM. The easiest analogy for this is a child’s merry-go-round. green arrow, it will twist clockwise. 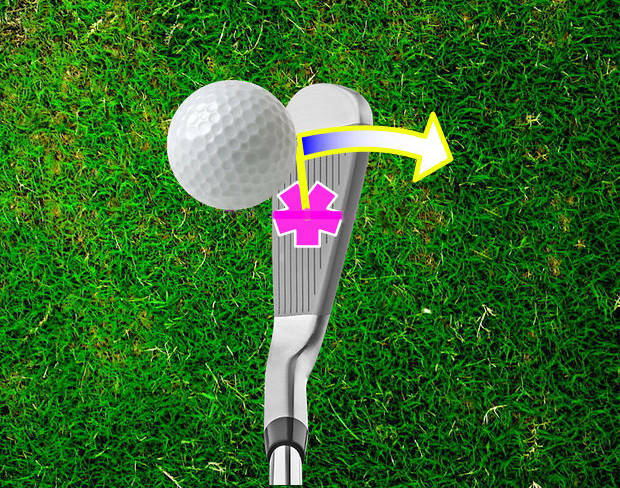 Now replace the merry-go-round with the clubhead. With an iron, because the centre of mass is close to the clubface (due to the thinner head design), the point of contact with the face will just move straight backwards on a toe or heel strike. Like a screen-door opening. 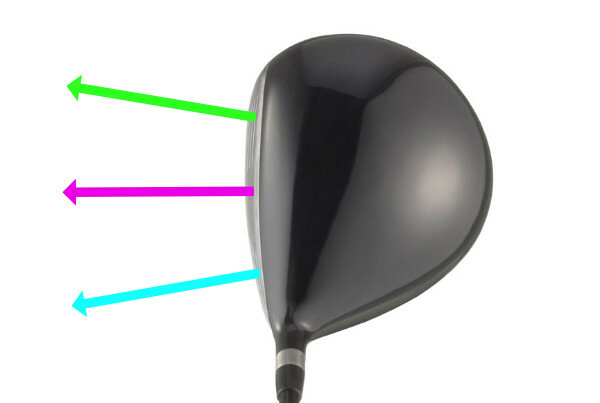 However, due to the size of the driver head (it’s deeper), this puts the COM of the clubhead farther back in the head. Because of this, on an off-center hit the contact point will not only move backwards (as in the iron), but it will also move more to the right on a toe shot (towards the top of the screen). This is reversed for a heel shot. 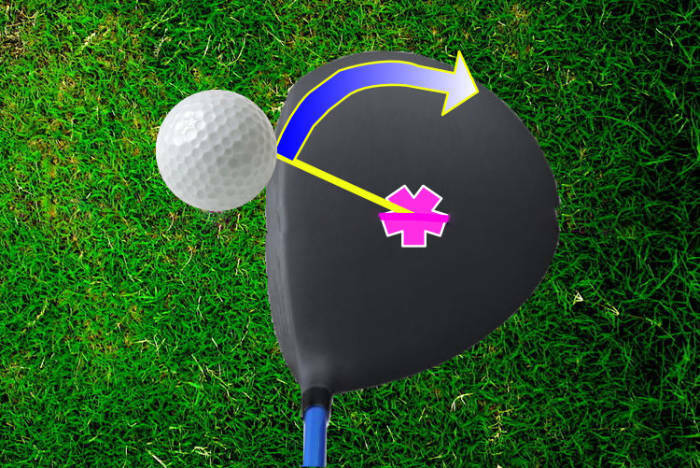 During the blue portion of the arrow, the point of contact is actually moving more to the right as it rotates around the club’s center of mass (pink gear). Think of it like the face rotating less like a screen door, and more like a clock. This is in complete contrast to what most people think would happen. Essentially (in a toe shot), as the clubhead is opening during contact with the ball, it is imparting more draw-spin to the ball than would otherwise occur. 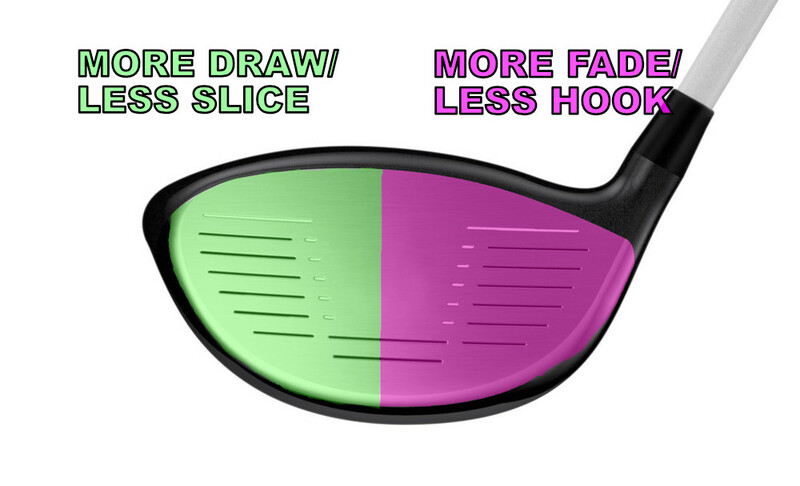 This is because a clubface which is OPENING is very different to a clubface which is PRESENTED OPEN. This is why your driver has what we call “bulge”. 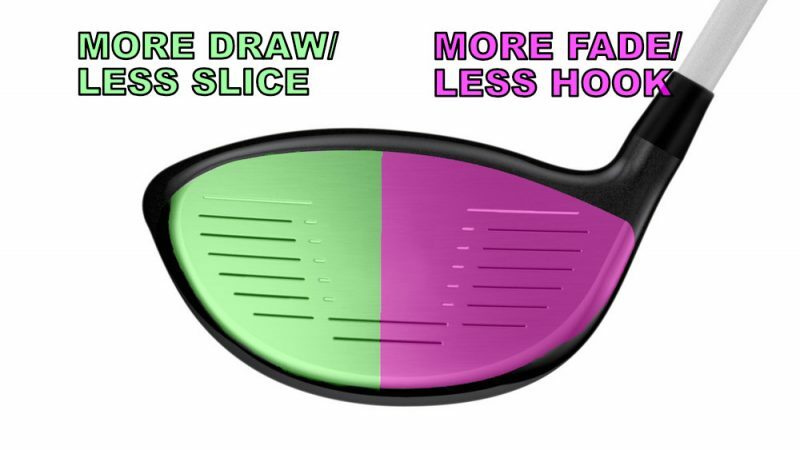 The clubface is slightly convex in shape – this means that different parts of the face actually point in different directions – the toe side (green) points more to the right, and the heel side (blue) points more to the left. This essentially counteracts gear effect to a certain degree. 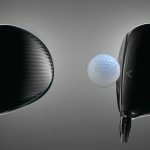 So, while a flat-faced driver would hit the ball off the left side of the golf course on a toe hit, your driver creates more of a toe-hook that is more likely to find the fairway. 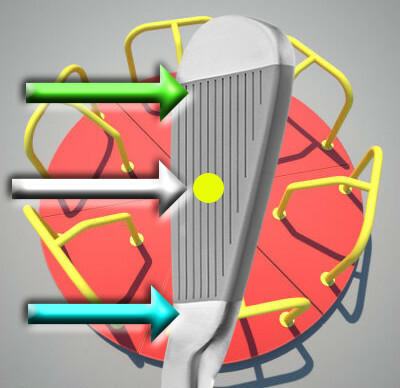 A toe-hit drive with a driver which doesn’t have bulge (red) versus a normal driver with bulge (green). 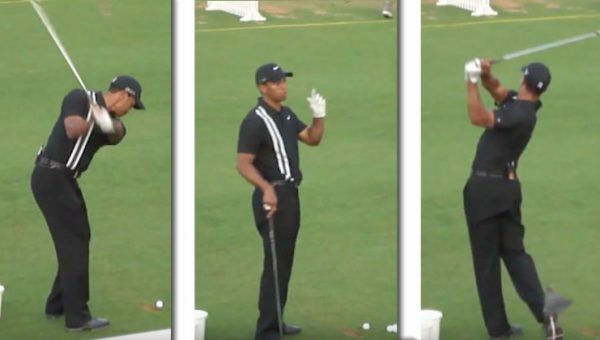 Your golf swing is under constant change. 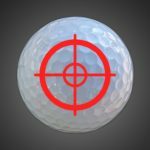 Every shot you hit gets fed into your subconscious, and you start to re-organize your movement patterns in order to try and get the ball onto the target – whether you like it or not. This is one of the ideas behind the concept of self-organization. Player A hits makes a great swing – a neutral path and a neutral face, but they heel the shot. 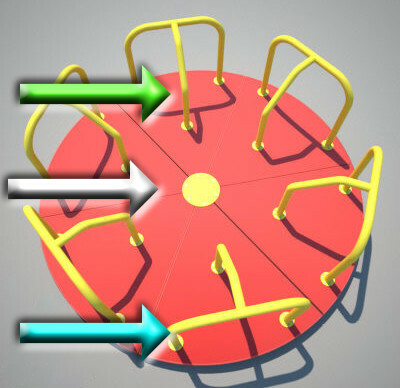 Due to not understanding gear effect, a player may (consciously or not) try to fix the swing in the wrong way. In fact, in the above example, the player didn’t need to fix their path or face – they needed to strike the ball better. Poor concepts lead to poor self-organization. This is how you amateurs get yourselves into a mess with your games. Gear effect doesn’t always operate like this – on more severe hits, the entire premise starts to reverse itself, and we can get toes slices and heel hooks. So what is a golfer to do? Gear effect sounds so chaotic, and the rules even change depending on the severity of mis-strike. Understand the above – re-read it, bookmark it, print it out. Share it to your facebook page so you get an “on this day last year” reminder in your newsfeed. Improve your awareness of concepts like this so your swing doesn’t self-organize into a complete mess, like most golfers. Improve your ability/skill of moving the strike pattern around the face, thus improving your ability to hit the sweet spot more often. 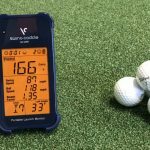 If you’re hitting the sweet-spot more often, you are going to get a whole host of benefits, from more greens in regulation (strongest correlator to handicap level), more distance, better spin control, improved accuracy and improved consistency. 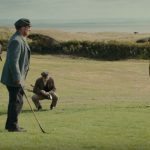 I would say that the vast majority of inconsistency and distance loss associated with driving the golf ball is due to poor and inconsistent strike quality. 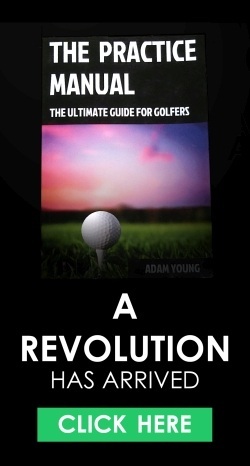 If you are an inconsistent drive of the golf ball, I would look at this as your first port of call to improvement. Hey, this is my website and I can do what I want. 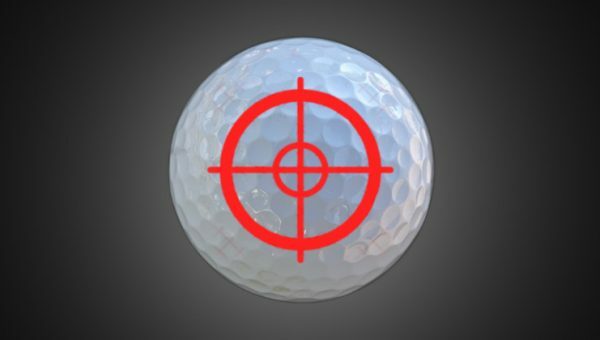 Besides, I can confidently say that The Strike Plan is the most comprehensive guide out there to improving this singular aspect (while having a positive knock on to other areas of your game too). The Strike Plan contains exercises to improve your ability to identify and fix strike issues – achieved through improvements in skill and technique. Many of these improvements can be seen instantly, and I use these drills every day in my teaching to get golfers better faster. If you want to find out more, click the image below. 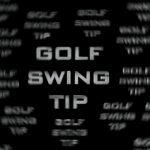 Essentially, off-center hits cause a bunch of chaos and result in your swing starting to re-organize into a mess in an attempt to fix itself. This effect continues until you collapse on the floor on the 15th hole proclaiming that you will never play this silly sport again. Really interesting stuff. 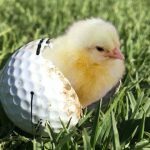 Do you recommend The Strike Plan for high handicappers? Hi Stephen, While there is some in-depth information in there, the drills and concepts are designed for all levels of player. 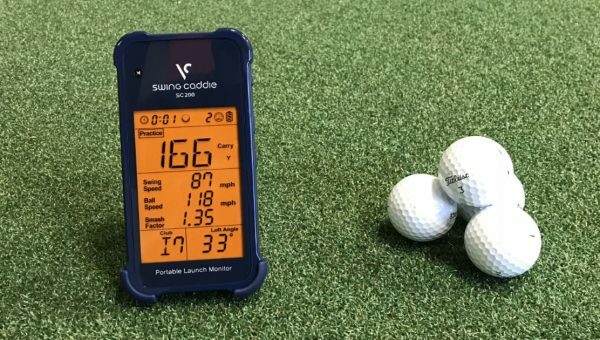 High handicaps in particular will benefit, as “strike-quality” is (in most cases) the part which is costing them the most shots and frustration. Do low torque shafts help golfers hit the centre more? I don’t believe they do. I can’t see why they would if a player is swinging and using a similar force and torque profile each time. 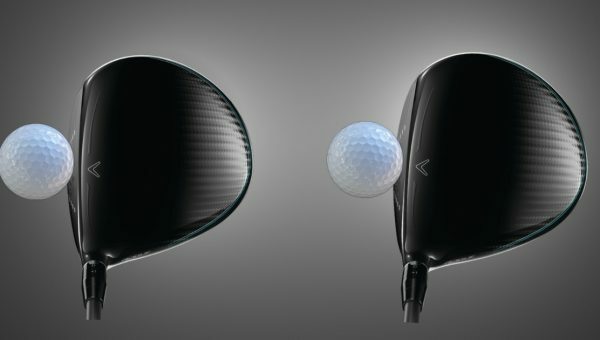 What are your thoughts on the new Taylor Made drivers with the “twist face”? I am in the middle of writing a review of the tech as we speak. Stay tuned. I have a superslow motion shot with my driver and the head twisted almost 90 degrees and I couldn’t understand why, and the shot was OK. here is the explanation, thank you.